CEFOBI researchers found that certain compounds, β,β-xanthophylls, mitigate the levels of ultraviolet radiation that can be harmful for plants. Dr. Paula Casati. Photo: CCT CONICET Rosario. Sunlight is necessary for photosynthesis as a vital process of plants. However, when UV radiation is high, it is dangerous for them. A research team at the Centro de Estudios Fotosintéticos y Bioquímicos (CEFOBI, CONICET-UNR), led by CONICET principal researcher Paula Casati, observed that a molecule, β,β-xanthophylls, protects the plants from ultraviolet radiation. The study was published in Journal of Experimental Botany. 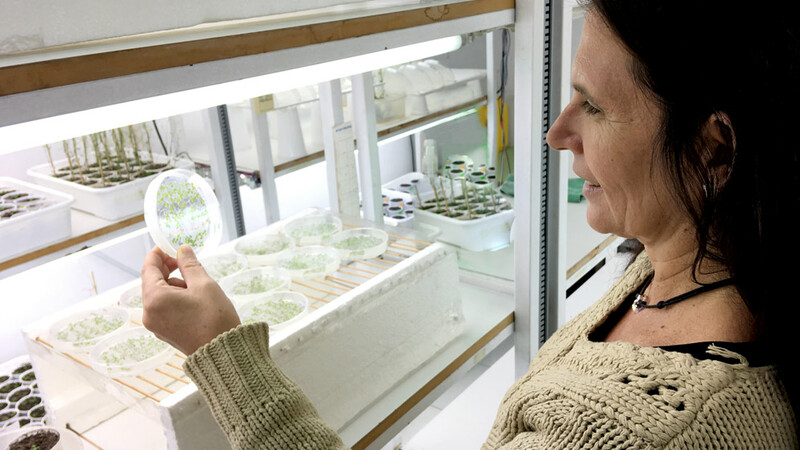 As part of her postdoctoral studies at the CEFOBI, Julia Emiliani reached that conclusion after irradiating mutant plants in different steps of the synthesis pathways of β,β-xanthophylls and other compounds related to ultraviolet and green radiation. She analyzed the way in which they tolerated that exposition. “As the synthesis of these compounds has several steps, she undertook the task thoroughly. That was how she managed to determine that the β,β-xanthophylls, which play a key role in the protection against high levels of white light, also protect the plants from ultraviolet radiation harm”, Casati describes. “Both the xanthophylls and the flavonoids have antioxidant properties, so apart from being favorable to the plant, the crops that contain these compounds can grow better in a natural environment and have benefits for those who will then consume them”, Casati comments. At the CEFOBI, scientists analyze how plants synthesize compounds that absorb ultraviolet radiation and protect them. For many years, the researchers work with one type of compound called flavonoids, which are the best known, most studied and accepted because they accumulate on the epidermis of plants, which is the surface layer, and absorb ultraviolet light. “It is not new that the β,β-xanthophylls protect plants from the excess of visible light, that is the light they use for photosynthesis and to grow”, the scientist describes. The research team includes the participation of María Lorena Falcone Ferreyra, CONICET associate researcher and Evangelina Maulión, both CEBOFI scientists; Eduardo José Rodríguez, CONICET independent researcher at the Instituto de Biología Molecular y Celular de Rosario (IBR, CONICET-UNR); and Lucio D’Andrea and Manuel Rodríguez-Concepción who work at the Centro de Investigación Agrigenómica (Crag) in Barcelona. By Ana Paradiso – CCT CONICET Rosario.